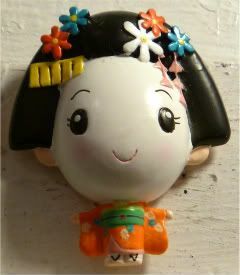 I picked this Japanese Kawaii girl at the AnimeFest portion of Comic-Con last year. I just thought she was adorable, and figured I needed her as part of my collection. She reminds me of all the Japanese classes I had to take at Carolina to appease my mother. I blogged about it before, she was totally convinced that Japan was poised to take over corporate America and that I should be ready. But man, those classes were seriously the bane of my existence my first two years at college. I loved, loved, loved writing the characters, but I was absolutely terrible at comprehension and spoken Japanese. It definitely wasn't the prof, because I have a friend who started out with me in JAPN101 and he's totally fluent and loves the culture and its people. Puts me to shame every time we get together, he does. Because I didn't want to finish out the final JAPN course, for fear of tanking my grades further, I ended up taking a crib class - Spanish. Flew through that class with flying colors. The Filipino language is somewhat based on Spanish, so there are many common words and even accents that Filipinos use. So I just pretended my parents were speaking Spanish to me in my head, and I mimic'd the Filipino accent. It's how I got my A for SPAN101, and funny praise for my terrific Spanish accent. I picked this magnet for today, because I never really notice my Asian-ness as much when I'm walking through the streets of my small hometown. In a Southern town of about 28,000, with only about 200 Asian people living here, that's probably not surprising.